Turmeric, referred to as Haldi in Hindi, is a common flavor in Indian cooking and also a significant ingredient in the pre-wedding Hindu event known as the Haldi, or Pithi, ceremony. Known to possess anti-inflammatory, healing, beautification, antiseptic, and purification properties, Haldi is essentially a cleansing procedure for the bride and groom to be. It’s beautiful mustard yellow hue is auspicious in Indian tradition representing a life of prosperity for the couple about to begin their new life together. A common reason why Haldi is used for this ceremony is to rid the couple of Buri Nazar, the Sanskrit term for evil eye. After the ceremony is completed, the Bride and Groom are expected to stay within the household in order to prevent all evil spirits. 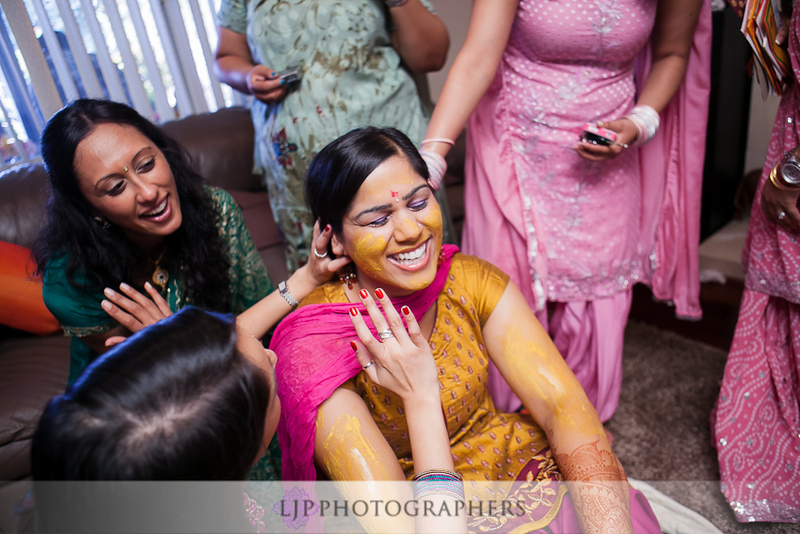 Haldi is most commonly found in powder form, however for this particular ceremony is it necessary for it to be made into a paste to apply on the bodies of both the Bride and the Groom. The ceremony is either held the day before the wedding or the morning of the wedding, the latter being a little difficult to carry out due to strict timelines for the day. It is held at the respective homes of the Bride and Groom because from this point in time the couple is not allowed to see each other prior to the wedding ceremony. The paste has a varied ingredient list due to personal regional preferences but essentially these are the ingredients which make up the paste: turmeric powder (Haldi), rose water or water, and sandalwood powder. Its pungent odor is one of its defining qualities, filling the room with a strong yet refreshing scent. The paste is applied with mango leaves by relatives of the couple to five specific body parts: the face/neck, arms, hands, knees, and feet. 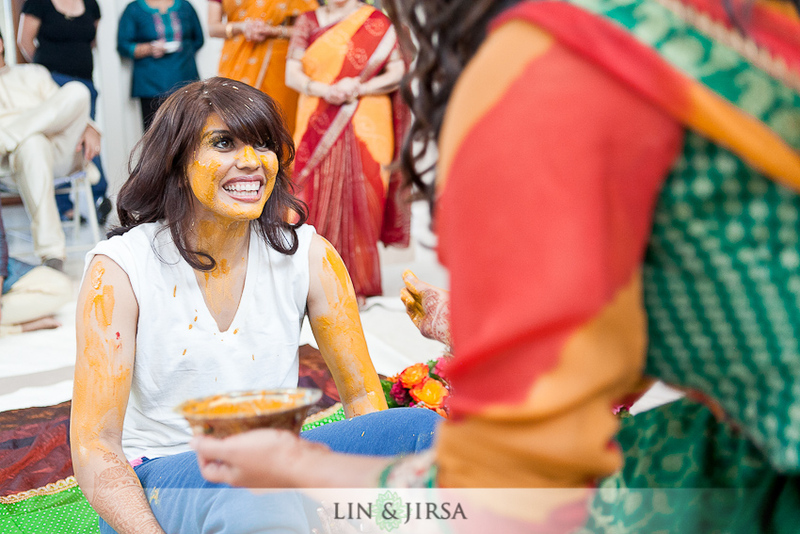 The bride and groom wear a traditional sari and kurta pajama respectively even though the Haldi can create quite a mess. While the ceremony is going on family members gather around to sing traditional songs pertaining to the ritual. Members of the family take turns placing a small amount of Haldi on the Bride and Groom offering their blessings while also cleansing the couple simultaneously. 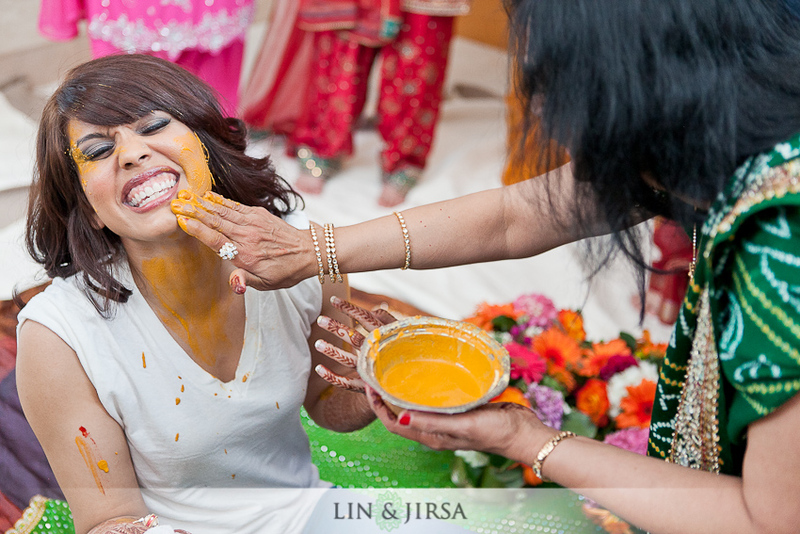 It is customary in certain parts of India for the couple to apply a small portion of the Haldi paste onto their unmarried friends and siblings in jest. Due to the powerful properties that the powder possesses, it is said that whoever gets touched by this paste is soon to find a good-looking partner. 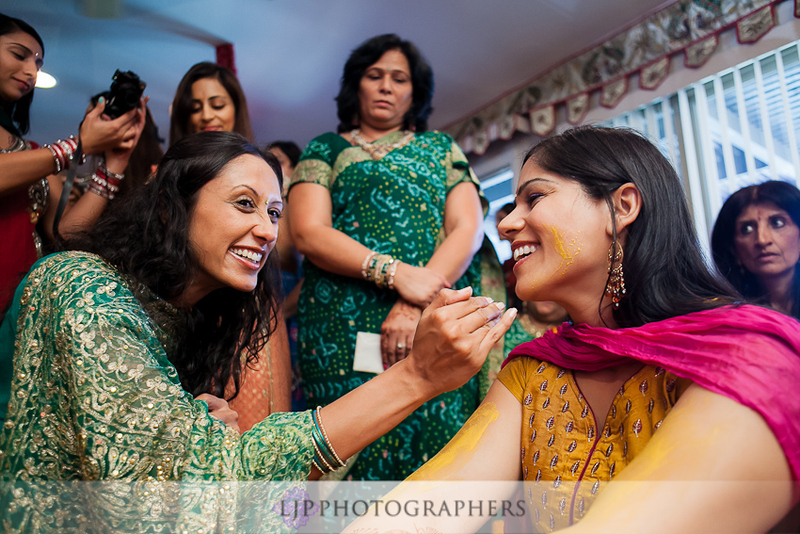 Family members of the Bride and Groom wash off the Haldi which reveals a natural glow and purification for the couple.